We have gone to great lengths to ensure that the facilities and service we provide are of a high standard. We have also applied the same high standard to the fish stocks we have acquired as well as to their ongoing welfare. We are sure we have achieved our aims. We hope you enjoy your stay with us. Lac d'Arcy is an 11 acre gravel pit, The depths range from 1.5m to 2.5m with a mainly gravel bed and some silty areas. There is a small island at one end. 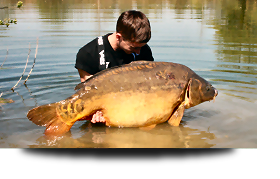 Most banks are tree lined, there are 10 large swims around the lake. 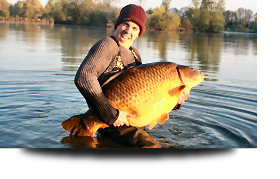 which will allow the 9 angler limit a good choice of water – approximately 1.25 acres per angler. The lake has been netted to remove the nuisance fish, there are no Poisson chat or crayfish. The lake has been stocked with, a good head of 30's and 40's 15 50+ and 3 60+.